A gentle shampoo with six natural cleansers, A’kin Lemongrass Shampoo deeply cleanses oily to combination hair and scalps. The light, sebum controlling formula is perfect for young, oily skin or those with psoriasis to leave the hair fresh and clean. 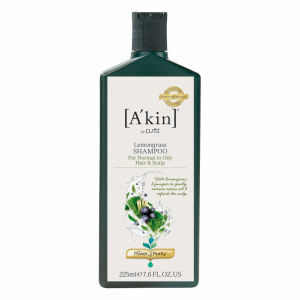 A’Kin shampoos use the purest and gentlest caring ingredients, which are sulphate and paraben free, to leave your hair and scalp thoroughly cleansed and silky soft. A’kin Lemongrass Shampoo uses a complex formula to gently dissolve oily scalp secretions without stripping the skin of its natural oils. Aqua (Water), Sodium Lauroyl Sarcosinate, Lauryl Glucoside, Sodium Lauryl Sulfoacetate, Cocamidopropyl Hydroxysultaine, Disodium Cocoamphodiacetate, Sodium Chloride, Glycerin, Sorbitol, Citric Acid, Sodium Citrate, Sodium Gluconate, Glyceryl Laurate, Sodium Cocoyl Glutamate, Pelargonium Graveolens Flower Oil (Geranium), Sodium Hydroxymethylglycinate, Rosmarinus Officinalis (Rosemary) Leaf Oil, Cymbopogon Schoenanthus Oil (Lemongrass), Citrus Aurantium Dulcis (Orange) Peel Oil, Citrus Nobilis (Mandarin Orange) Peel Oil, Tetrasodium EDTA, Juniperus Communis Fruit Oil (Juniper), Eugenia Caryophyllus (Clove) Leaf Oil, Limonene, Citral, Citronellol, Geraniol.